People place their hands on the bad one (played by John Reynolds) during an episode of “The Chris Gethard Show” named after Sleater-Kinney’s song. Members of S-K play along too (Carrie Brownstein in the background, Corin Tucker and Janet Weiss in the foreground on the right). An image that I took during an episode titled “All Hands on the Bad One” (featuring the band Sleater-Kinney and musical guests Priests) runs with her essay for The Talkhouse here. It’s mentioned in the 14th step. More images from that episode are available on Flickr here. I recently took images of four bartenders in Brooklyn, NY mixing cocktails inspired by family and heritage for a piece on Per La Mente. The article is now live and you can view it here. In June, I had the pleasure of taking portraits of Cheena for an interview on Bandcamp. Their feature is now live here along with the above image plus a few others. On Friday, July 1, 2016, KATIEE held a record release show at Secret Project Robot with Invisible Circle, Dan Friel, and Alice Cohen. More images from the show are now available on Impose Magazine and Flickr. On Saturday, July 2, 2016, House of Feelings curated an afternoon of DJ sets and live performances by Horselover Fats. Live images and portraits of the DJs (DJ Eric Phipps, DJ KYK, and DJ Fitness) and Horselover Fats (pictured above) are now available on Impose Magazine here. KATIEE was interviewed by Bandcamp last month and we took some portraits for the piece at Giando on the Water on a lovely Tuesday afternoon. The interview and photos are now available on Bandcamp Daily here. How did Toronto's BadBadNotGood become jazz gurus? You can find out and view some portraits I took of them on Thursday, June 7, 2016 right here on Bandcamp Daily. The Seattle band known as Childbirth performed in New York City for the first and second time on Thursday, June 9 and Friday, June 10, 2016 during Northside Festival. I spent time with the band before, during, and after their performance at Baby's All Right in Williamsburg, Brooklyn on Friday. More images from that day can be found on Impose Magazine here. I was lucky enough to spend some time with two rappers I've been following for a while: Jean Grae and Mike Eagle. For the feature on Impose, we had lunch and spent some time in two bars in north Brooklyn that I enjoy: Turkey's Nest and Barcade. More images from the day can be found here on Impose. Thanks so much to both artists for being so cool and game for me following them around and taking pictures of them for a couple of hours. 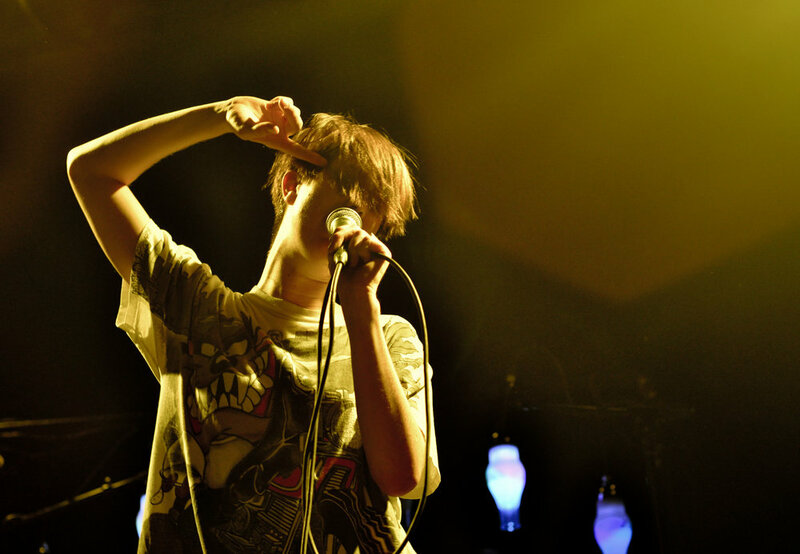 Musician Erika M. Anderson, otherwise known as EMA, performs at Music Hall of Williamsburg on Friday, March 16, 2012. Additional photos are available on Flickr and Impose Magazine. 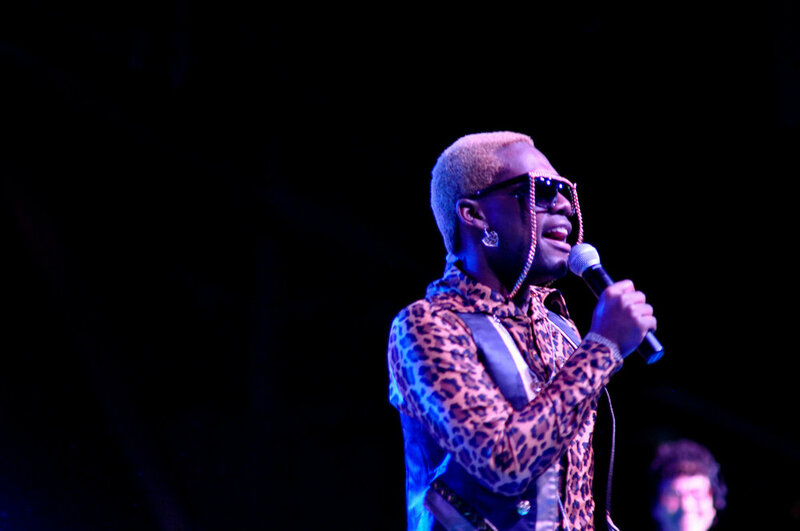 New Orleans bounce artist Nicky Da B performs at Brooklyn Bowl on Saturday, January 21, 2012. Santa on the 6 train during Santacon 2011. 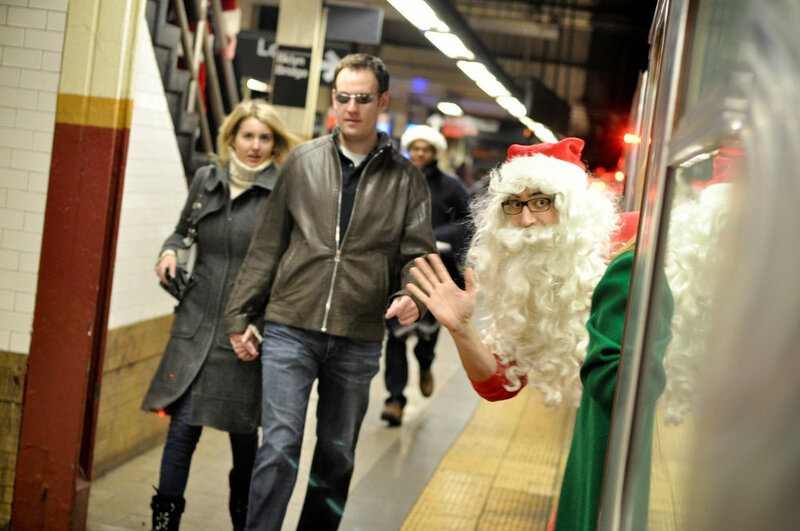 A participant of the yearly Santacon event waves as he boards the train at Brooklyn Bridge - City Hall on Saturday, December 10, 2011. Additional photos that I took from the day are available on Flickr. Photo of Rick Froberg of San Diego, CA band Hot Snakes performs at Brooklyn, NY's The Bell House on Thursday, December 1, 2011. The band broke up in 2005 and is in the midst of a very brief reunion tour which made two New York City area stops (The Bell House on Thursday and Hoboken, NJ's Maxwell's the following night). Additional photos from the show can be found on Flickr and Impose Magazine. Nolen Strals of Double Dagger sings while crowdsurfing during the band's final New York show on Thursday, October 20, 2011. The band played one final show the following night in their hometown of Baltimore, MD. Additional photos are available on Flickr and Impose Magazine. A recap I did of the show (and other Double Dagger performances) can be found on these are not photographs. A fan holds a foam Double Dagger finger during the band's final New York show on Thursday, October 20, 2011. Double Dagger played one final show the following night in their hometown of Baltimore, MD. Tessa Gee (foreground) & Ariel Sims of Brooklyn, NY's Tayisha Busay perform at The Marlin Room at Webster Hall on Wednesday, October 19, 2011 during the annual CMJ Music Marathon. The band won a spot on SESAC's NYC Rising Showcase and performed along with Headless Horseman, Julien Funk, Little Devil and MaG. Additional photos from Tayisha Busay's performance are available on Flickr. Johnny Siera of The Death Set is held above the ground by audience members during the band's CMJ Marathon set at The Studio at Webster Hall on Tuesday, October 18, 2011. The band performed their first two EPs (To & Rad Warehouses, Bad Neighborhoods) on the floor of the venue the way the songs were recorded (two guitars and the use of a drum machine). Additional photos are available on Flickr. Bassist Bob Weston (right) removes parts of Todd Trainer's drumkit at the end of the Shellac show at Brooklyn, NY's The Bell House on Monday, October 3, 2011. 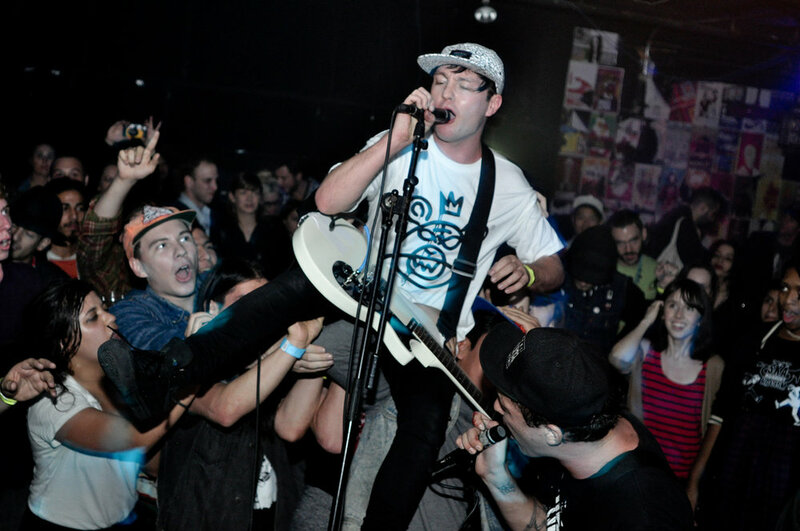 Additional photos from the show are available on Flickr and Impose Magazine. A recap I did of the show can be found at thesearenotphotographs. 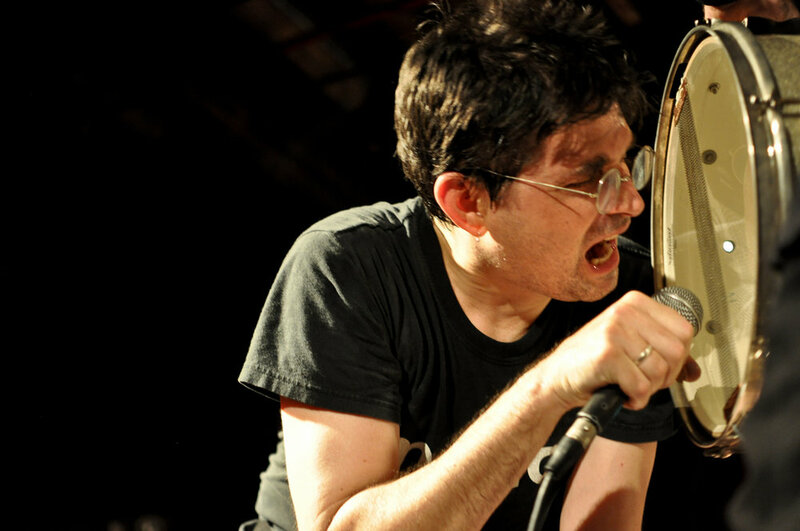 Steve Albini of Chicago, IL's Shellac, sings into a snare drum during the song "The End of Radio" at The Bell House on Monday, October 3, 2011 in Brooklyn, NY. Additional photos from the show are available on Flickr and Impose Magazine. A recap I did of the show can be found at thesearenotphotographs.